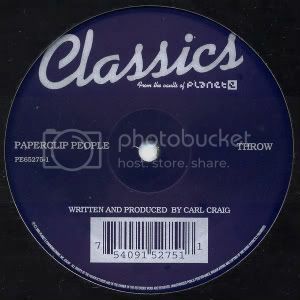 Carl Craig delivers 2 of his all time classic Paperclip People productions on the retrospective label Planet E Classics. Using the original plates for the masters Carl drops the housed-up winner ‘Throw’ with its proper disco loop, engineered the C2 way, simple organ stabs start the music and are consistently layered as the mammoth track progresses, building up to one of those Detroit dancefloor moments where the vocal drops in and the track filters lower for a proper vintage breakdown, amazing stuff. And the B side tracl is the aptly titled and global deep dancefloor classic ‘The Climax (PCP Version)’, which is a different version to the original version last released on Planet E with a Basic Channel remix on the flip. This version stays beat ridden and tough and saves the climactic and amazing breakdown until near the end, but all the ingredients remain the same, classic breaks and guitar, that looped whistling synth, and the fat chord stabs that chunk the track up, plus the second to none production. For over a decade The Climax has been one of Detroit's shining moments, and still is, Pure genius. Finally. Needed that Throw in 320 including those vocal screams. Throw = The best CC track. thanx mate.. this is great !